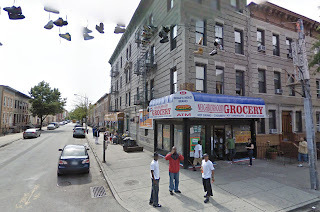 The images show a trio of drug dealers hanging out outside Neighborhood Grocery on the northeast corner of Jackson Street and Kingsland Avenue, where they set up shop within 1,000 feet of a school. Those three men, along with four others, were arrested in a sting yesterday by cops disguised as "heroin-hooked hipsters" — presumably the crew's typical clientele. Not pictured here, the dozen or so pairs of shoes hanging on the power line above the bodega.